Stop the vehicle on a level surface. 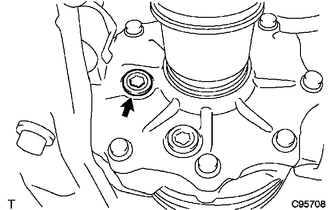 (a) Using a 10 mm hexagon wrench, remove the rear differential carrier cover plug and gasket. 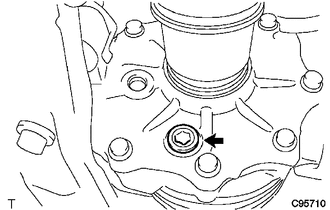 (b) Using a 10 mm hexagon wrench, remove the rear differential drain plug and gasket to drain the differential oil. (a) Using a 10 mm hexagon wrench, install a new gasket and the rear differential drain plug. 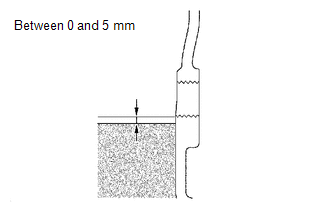 (a) Add differential oil so that the oil level is between 0 and 5 mm (0 to 0.196 in.) from the bottom lip of the rear differential carrier cover plug opening. Too much or too little oil will lead to differential problems. After changing the oil, drive the vehicle and then check the oil level again. (a) Check that the oil level is between 0 and 5 mm (0 and 0.196 in.) from the bottom lip of the rear differential carrier cover plug opening. (b) Inspect for oil leaks if the oil level is low. (a) Using a 10 mm hexagon wrench, install a new gasket and the rear differential carrier cover plug.